The Gefen EXT-HD-DSMP HD Digital Signage Media Player provides an effective means to playback and schedule digital signage content on both digital and analog connections. By connecting the HD Digital Signage Media Player to a network, content can be pushed to the box using a computer and FTP client program. When a more elaborate setup is required, a number of units can be installed to pull content from a local or external FTP server based on a schedule. The HD Digital Signage Media Player acts as both an FTP client and server with live logging of various important statistics, such as playback, system status, and uploaded content. The HD Digital Signage Media Player provides an intuitive directory and file structure that can easily be created and maintained by any text-based editing program. This allows you to concentrate on the important task of content creation. For precise time synchronization, the HD Digital Signage Media Player can be set up to access an external NTP server. Many audio and video file formats are supported with NTSC and PAL output resolutions up to 1080p Full HD. 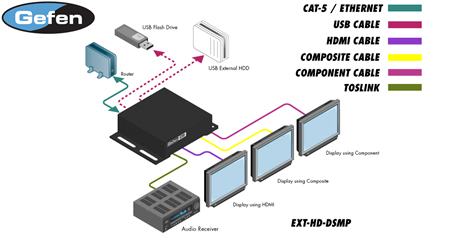 HDMI, Composite, and Component outputs with separate analog and digital audio outputs provide flexibility when connecting to various displays. Two USB 2.0 ports provide connection to the included USB flash drive or to an external hard drive. The HD Digital Signage Media Player enclosure features integrated mounting brackets for a secure installation on any flat surface or directly to the back of the display. For complete management of multiple devices in multiple locations, Gefen provides a CMS (Content Management Software) solution which can be run in a virtual environment. The Gefen CMS will allow you to easily manage all of your units in the field from any compatible browser with access to logs, schedules, content, and playlists. The Gefen EXT-HD-DSMP HD Digital Signage Media Player can connect to a display using either analog or digital video connectors. Connect an HDMI, Component, or Composite cable between the HD Digital Signage Media Player and the display. If using the networking capabilities of the HD Digital Signage Media Player, connect your network cable to the Ethernet port. Optionally, the digital or analog audio output connector can be used to connect the HD Digital Signage Media Player to an external audio processor or amplifier. Connect the included USB flash drive to the rear panel of the unit. Connect the 12 V DC power supply to the unit and connect the AC power cord to an available electrical outlet.